Planning to spend your golden years catching up on sleep? That might not be a good idea. 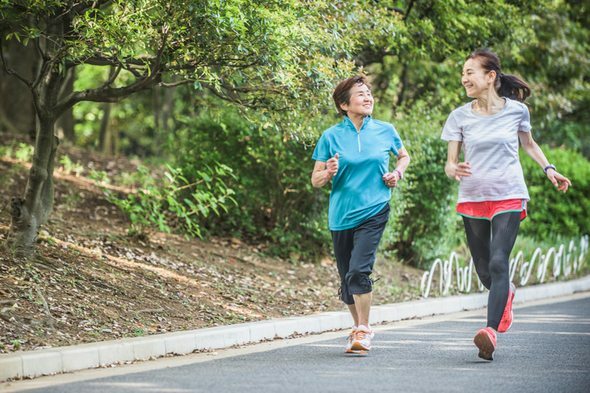 A recent study from the National Institutes of Health found that physical activity may increase one’s life expectancy by as many as four-and-a-half years. Of course, your ability to remain physically active in retirement may depend, in part, on your environment. Some cities simply make it easier for retirees to live active lifestyles. Read the 2016 edition of this annual study. 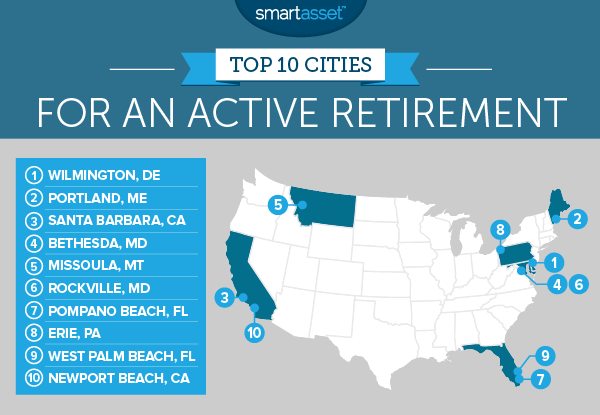 SmartAsset wanted to find the best cities for an active retirement. So we ranked the 575 largest U.S. cities across various metrics, including the average effective tax rate, the number of local retirement communities, the senior citizens population percentage and the number of local doctor’s offices. We also looked at the walk score in each city, the number of golf courses and the concentration of fitness-related businesses. Read our data and methodology section below for more details about how we completed our study. Wilmington wins. This city ranks as the best place for an active retirement for the second consecutive year. Delaware is a tax friendly state for retirees. That’s one reason why Wilmington rates so well. The East Coast is best for an active retirement. Six of our top 10 cities are located off the coast of the Atlantic Ocean. Based on our calculations, a senior who lives in Wilmington and earns $35,000 per year would have an average effective tax rate of roughly 9.4%. Plus, Wilmington has a high walk score: 72. That explains why it ranks as the No.1 city for active retirees. Portland, Maine could be the ideal retirement spot for anyone who’s planning to spend a large portion of their golden years enjoying the outdoors. The city’s walk score is 60. And its bike score is even higher at 62. Popular trails for walkers and bikers include the Eastern Trail and the Eastern Promenade Trail that runs along Casco Bay. For seniors who want to stay active, Santa Barbara has a lot to offer. The city is very bikeable and has nearly five golf courses for every 100,000 residents. What’s more, it ranks as one of the best wine destinations in America. Bethesda is a city with a sizable retiree population. About 18% of its residents are above the age of 64. Think you’ll have nothing to do after you retire? Think again. Seniors who are trying to stay busy after leaving the workforce can always take up golf as a hobby. For every 100,000 residents in Bethesda, there are more than six golf courses. Missoula recently ranked as the most fitness-friendly place in the country. For active retirees who live in the area, that’s great news. Something that’s also worth mentioning: Its walk score increased by two points within the past year. Now it’s 45. While Missoula still isn’t very easy to navigate on foot, walkscore.com describes it as somewhat bikeable. Rockville ranks as the sixth-best city for active retirees. It’s part of the Baltimore-Washington metro area and has more than 64,000 residents. It also has one of the highest concentrations of retirement centers in our study. Some studies suggest that older adults with close friends are more likely to live longer. So being an active member of a community of seniors may be part of the key to longevity. Florida is considered a very tax friendly state. That’s because it’s one of a handful of states without an income tax. This means that retirees don’t owe taxes on income from pensions, Social Security, IRAs or 401(k)s. While there are many great places to retire in Florida, you may want to check out Pompano Beach. There are at least six doctor’s offices for every 1,000 residents. For active retirees who are trying to stay healthy, having access to medical professionals is important. Plus, there’s nothing like living by the beach year-round. The state of Pennsylvania offers its residents some sweet tax benefits, too. Retirement income coming from an IRA, a 401(k) or Social Security isn’t taxed. Neither is pension income for seniors above the age of 59. And while there’s a statewide sales tax, there’s no tax on certain items, including medication, most clothing and most food. Erie is located in the northwest corner of Pennsylvania. If you retiree there, you’ll be able to take advantage of the perks that the state offers its taxpayers. You’ll also have access to golf courses like the Millcreek Golf and Learning Center. There are four for every 100,000 residents. Finding a retirement community in West Palm Beach isn’t difficult. There are many different ones to choose from that give older adults the chance to live independent lives. There are also more than five doctor’s offices for every 1,000 residents and more than four golf courses for every 100,000 people. So a senior who wants an active retirement lifestyle should fit right at home in West Palm Beach. Newport Beach has quite a few retirees. Seniors make up roughly 20% of its total population. Unfortunately, California ranks as one of the least-tax friendly states in the country. The Sunshine State has high sales taxes and income taxes. And pensions and retirement distributions are taxed fully. If you can afford to retire in California and you plan to live an active lifestyle, consider moving to Newport Beach. There are nearly six golf courses for every 100,000 people. And if you over do it and end up with an injury, there should be plenty of medical centers in your vicinity. To find the best cities for an active retirement, we ranked the 575 biggest cities using the following metrics from our analysis of the best places to retire in 2017: the number of retirement communities per 1,000 residents, the number of doctor’s offices per 1,000 residents and the senior population percentage. We also used the average effective tax rate from our retirement study, which is calculated (using our retirement tax calculator) based on incomes taxes, sales taxes and applicable rules and deductions for a retiree earning $35,000 per year. The other three metrics reflect a retiree’s ability to live an active lifestyle. We pulled data on the number of fitness-related businesses (like recreation centers and gyms, as a percentage of all local businesses) and the number of golf courses per 100,000 residents in each city. We also used walk scores from walkscore.com to measure each city’s walkability. After ranking each city according to each metric, we averaged our rankings, giving double weight to the walk scores and full weight to the rest of the metrics. Then we created an index and gave each city a raw score. 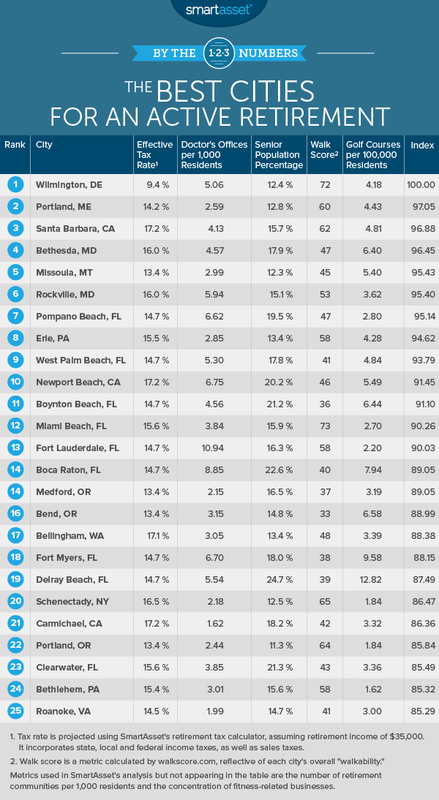 The highest-ranking city received a 100 and the lowest-ranking city received a zero. Our population data comes from the U.S. Census Bureau’s American Communities Survey. Our data on the concentration of fitness-related businesses and the number of golf courses, retirement communities and doctor’s offices come from the Census Bureau’s Zip Code Business Patterns survey. Figure out how much you’ll need to save to retire comfortably. An easy way to get ahead on saving for retirement is by taking advantage of employer 401(k) matching. Work with a financial advisor. According to industry experts, people who work with a financial advisor are twice as likely to be on track to meet their retirement goals. Read our guide to finding a financial advisor. Nick Wallace completed the data analysis for this study. Questions about our study? Contact us at press@smartasset.com. Amanda Dixon Amanda Dixon is a personal finance writer and editor with an expertise in taxes and banking. She studied journalism and sociology at the University of Georgia. Her work has been featured in Business Insider, AOL, Bankrate, The Huffington Post, Fox Business News, Mashable and CBS News. Born and raised in metro Atlanta, Amanda currently lives in Brooklyn.